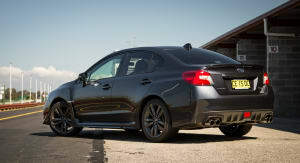 Starting at $38,990 (before on-road costs), the Dark Grey entry-level six-speed manual Subaru WRX tested here undercuts its STI equivalent by more than $10,000. 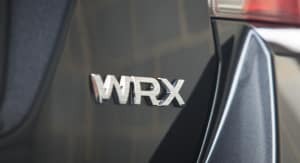 The all-new fourth-generation WRX doesn’t get the STI’s Brembo brakes, centre differential control or borderline rally-spec rear wing, but it does come standard with 18-inch alloy wheels, a boot-lip spoiler and a brand-new engine. That’s right. 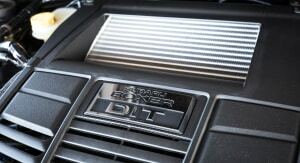 Although the ‘new’ STI makes do with the same 2.5-litre four-cylinder engine carried over from the previous model, under the latest WRX’s mandatory bonnet scoop is an all-new direct-injection 2.0-litre ‘boxer’. 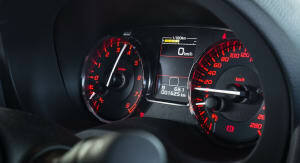 Producing 197kW of power at 5600rpm and 350Nm of torque between 2400-5200rpm – up 2kW and 7Nm from the third-gen WRX’s 2.5-litre unit – the new engine helps the all-paw WRX claim 0-100km/h in 6.0 seconds. 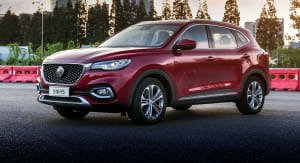 Actually 0.7s slower to triple figures than the old $39,990 five-speed manual WRX, the new ‘Rex’ is still brisk enough off the line to better the more expensive Volkswagen Golf GTI and identically priced Ford Focus ST – both front-wheel drives. 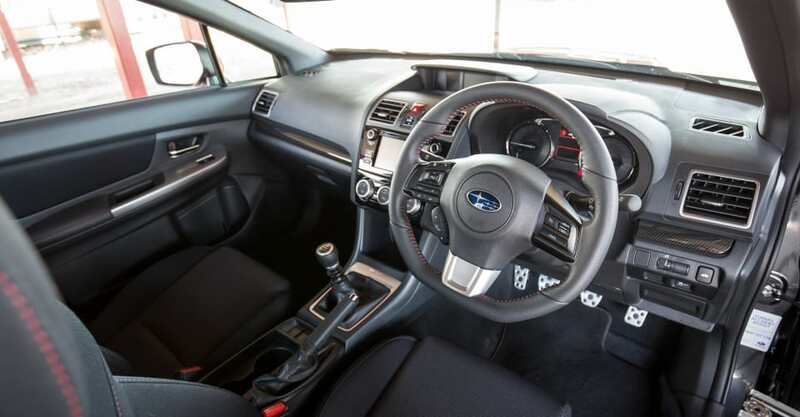 To find out how it performs lap after lap, though, we slide into the WRX’s red-stitched bucket seats and turn the key (a push-button start is reserved for the $44,890 WRX Premium). At Sandown, again participating in a Driver Dynamics Level 3 High Performance driver training day, the conditions are perfect. 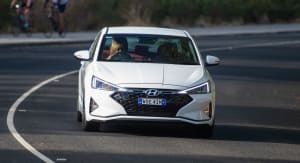 It’s dry, it’s 23 degrees Celsius and the assortment of cars on display vary from the usual Toyota 86s and Volkswagen Golf Rs to some rather high-end metal. 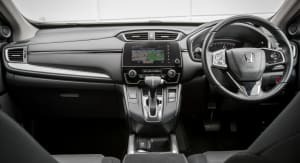 Unfortunately, we can’t all own an Audi, Ferrari, Lamborghini, McLaren or Porsche, though, so we roll out of pit lane in our humble Subaru with our hands on the red-stitched leather steering wheel and half an eye on the dash-top-mounted digital boost gauge. 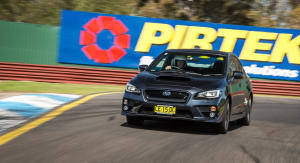 Starting the day with smooth, and relatively gentle, ‘warm-up’ laps – always a better option than pushing too hard, too early, and ending the first session in the kitty litter – two things immediately feel ‘right’ about the WRX: the notchy but accurate short-shift gearbox and how well its throw is matched to the excellently placed pedals. 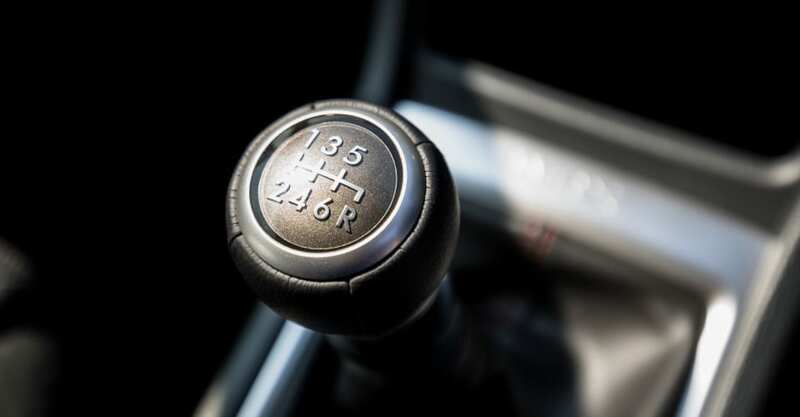 The transmission doesn’t love to be ‘rushed’ through shifts, however, overall, the combination makes heel-and-toe shifting a breeze. 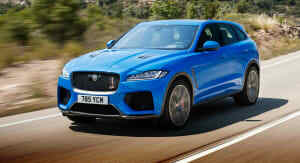 Steering is on the lighter side for a sports car, but the electrically-assisted system is consistent in its weighting and responsive to inputs. As the number of laps rise, so does our speed and commitment. 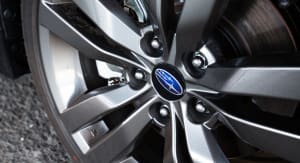 Pushing a little harder, the WRX’s standard two-piston caliper front, single-piston caliper rear brakes begin to expose themselves as a bit of a weak spot. 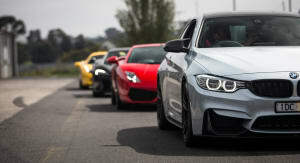 Now, the 3.1-kilometre Sandown circuit is notoriously hard on brakes, but while the 245mm-wide and 40-aspect Dunlop Sport Maxx RT tyres are just starting to warm up, the brakes (comprising 316mm ventilated discs up front and 286mm solid discs out back) are already moving beyond their optimum. 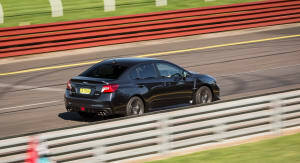 Helped by excellent grip from the Dunlop rubber, with Subaru’s famous symmetrical all-wheel-drive underpinnings, a viscous limited-slip centre differential and an active torque vectoring system on board, in the WRX, you can basically just point and shoot your way around the track. Making the thing very straightforward to drive fast – though still a lot of fun – you can get away with simply arriving at a corner, tipping it in, spotting the corner exit, and planting the foot. 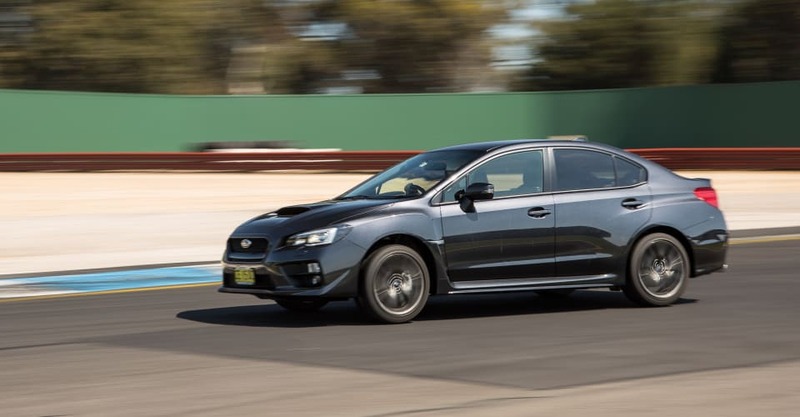 As expected with an all-wheel-drive car, over-drive the WRX a little, or throw in some throttle a touch too early, and you can induce some understeer. 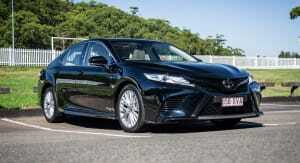 But any ‘push’ can be easily nullified by being patient and measuring throttle, brake and steering inputs. 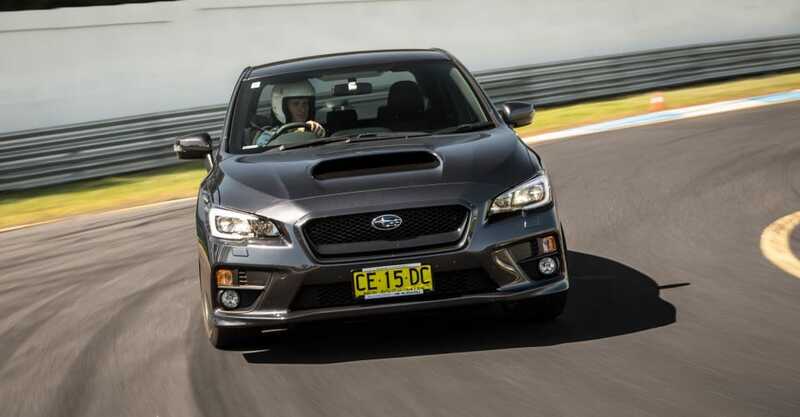 Somewhat surprisingly – given the WRX’s 1469kg kerb weight – on track, its mass impacts more on braking performance than agility. More laps in, and while the rest of the package is holding up extremely well to Sandown’s 13 turns and two high-speed straights, the brakes are urging us to back off and come in – or at least throw in several mid-session cool-down laps. 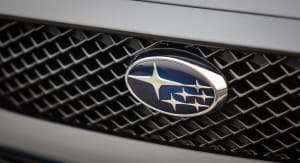 On the road, the Subaru’s 2.0-litre engine can be a little laggy under around 2500rpm, but hustling around the circuit, you so rarely drop to anywhere near those sort of revs, it’s simply not an issue. 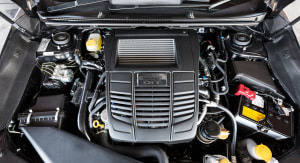 Linear in its power delivery, the engine pulls strongly from 4000rpm all the way to its near-7000rpm rev limit, winding out to just shy of 190km/h in fifth gear at full noise. Speaking of noise, while the classic WRX ‘boxer’ burble is still detectable, the standard engine and quad-exit exhaust aren’t quite able to offer the same aural delights as an old-school modified ‘Rexy’. 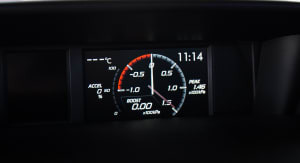 Claiming 9.2 litres per 100km on the combined cycle, our day’s end average skyrockets to 24L/100km – understandable, though, given the amount of wide open throttle used. Standard brakes aside, for the 2016 Subaru WRX to offer the sort of performance and fun it does, for the price, is impressive. But to offer the level of outright ability it does, for the same money, really is quite remarkable. 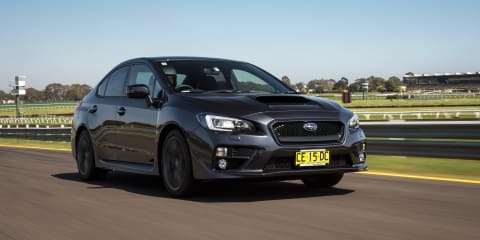 And when you consider that its nearest genuine four- or all-wheel-drive rivals – such as the Audi S1 and Volkswagen Golf R – are priced above its STI sibling, the all-new Subaru WRX certainly has value on its side too. 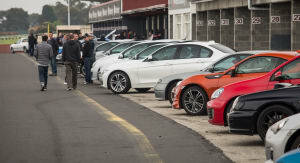 As for our question of whether it can handle a day on track? 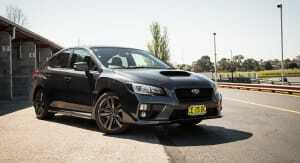 Well, apart from some rather hot brakes, the new WRX not only enjoys them, it eats them up. It’s also another great example of an affordable sports car you can drive straight out of the showroom and onto the track. Click on the Photos tab for more 2016 Subaru WRX images by Tom Fraser and read more CarAdvice Weekend Warrior track tests here.